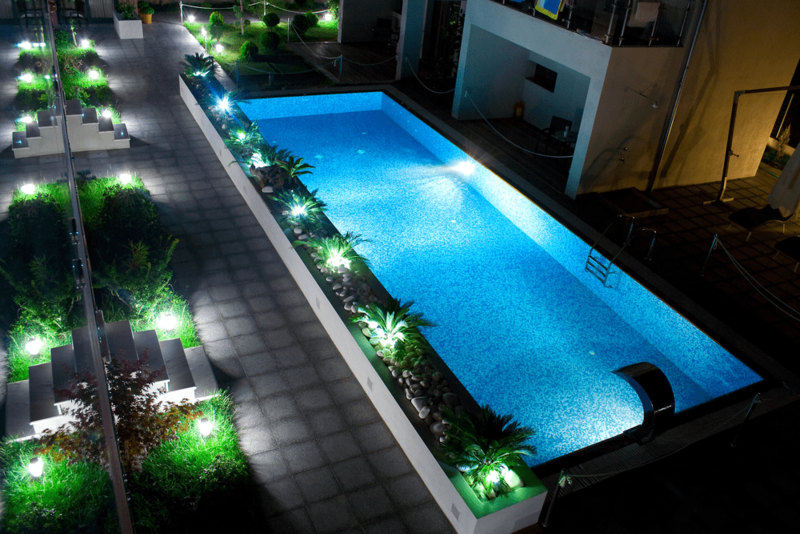 In hot summer days, nothing is more inviting than a crystal clear swimming pool. If you are a pool owner, you would know this well that a sparkling pool requires high maintenance. Debris leaves, and fungus can settle in the pool and make it untidy and dirty, of course. It’s almost impossible to pick all these leaves and clean the debris manually every other day. Luckily, pool vacuum heads are available on the market to help you win the fight against falling leaves and other kinds of remains. 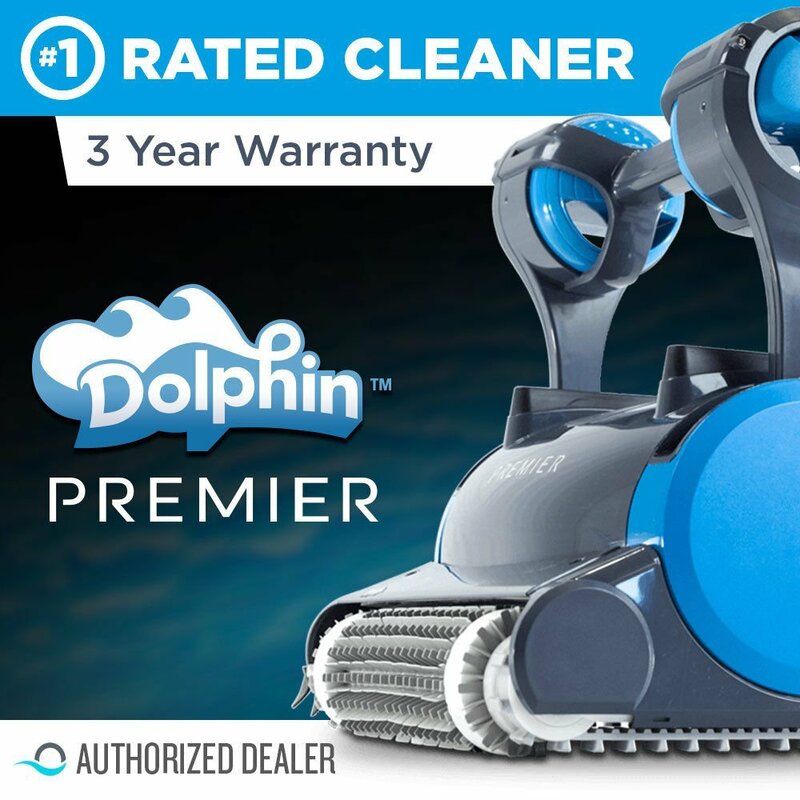 2 What To Look For When Buying A Pool Vacuum Head? Milliard 14” Flexible Spa and Pool Vacuum Head is a rectangular shaped vacuum head designed for Cleaning Debris from Pool Floors. The body of the vacuum head is made from a strong and flexible plastic body. Although the overall, the vacuum head is lightweight to use, it is sturdy enough to remain at the bottom of the pool instead of floating. There are free rolling wheels under the vacuum head to further assist you with the cleaning without scraping or scratching the surface. The vacuum head also has a handle adapter to enable you to use it with all standard pool extension poles. You can also adjust the spring loaded locking clips. You are ready to fish the dirt out of the pool as you attach the vacuum hose from your pool’s filter–pump to the 1.5-inch suction port. 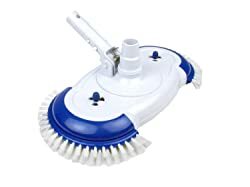 Milliard Sea-Thru Triangle vacuum head is 11 inches wide with nylon bristles at the bottom to gently clean the surface of the floor. The vacuum head is specially angled to funnel dirt instead of pushing it around. 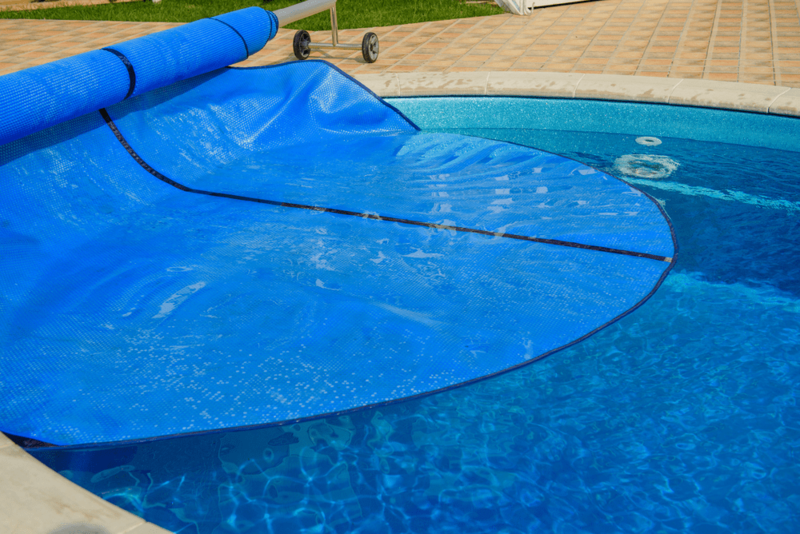 It’s made from durable plastic material that’s also resistant to the usual pool chemicals. The vacuum head has a strong weight to stay at the bottom of the pool. 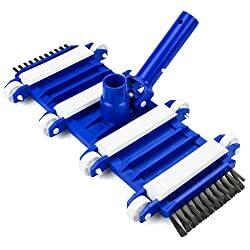 Along with bristles at the bottom, there are rubber bumpers at the sides to prevent scraping and scratching when you are cleaning delicate surfaces. The body of the vacuum is see-through which makes it easy to maneuver. You will know what you are cleaning and you will be able to reach the walls and corners better than any ordinary vacuum head. You can attach it to any standard extension pole. Its port easily fits ½ and 1¼ inch standard vacuum hoses. U.S. 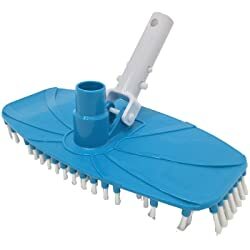 Pool Supply Flexible 12″ Weighted Pool Vacuum Head has a rectangular design with nylon bristles at the bottom. The vacuum head has a flexible body which makes it easy to maneuver. 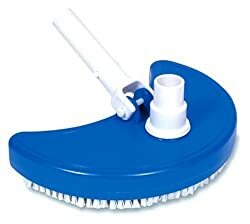 The bristles help clean the walls, slopes, and corners of the pool smoothly. 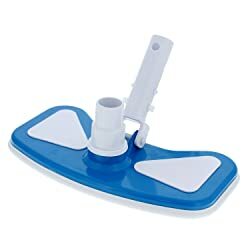 You can twist the head and reach the right corners and crevices while keeping the vacuum head in contact with the pool’s surface. 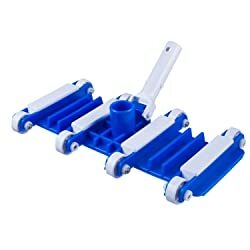 The EZ clips make it easier for you to connect and disconnect standard 1-1/4″ and 1-1/2″ poles with the vacuum hose. 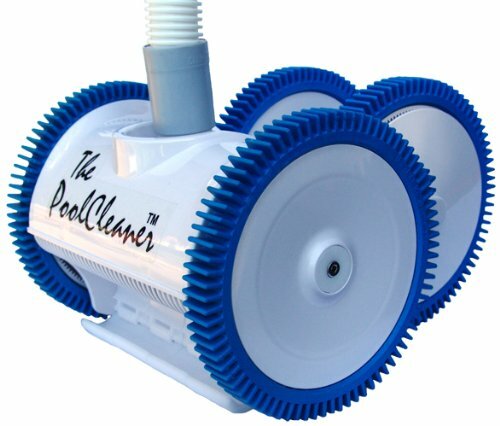 Fibropool Professional Flexible Swimming Pool Vacuum Head has a thermoplastic body that’s flexible enough to reach every nook and cranny of your pool. The vacuum heads 6 integrated weights to make sure it stays on the pool’s surface and you enjoy maximum cleaning poor. Its vacuum suction readily connects to a standard 1.5″ hose. The handle is chrome plated and it can attach itself to most standard-sized extension poles. This hence ensures the vacuum head lasts longer than ordinary ones. Under the head are urethane wheels with metal ball bearings that protect the surface of the pool from scratches. U.S. 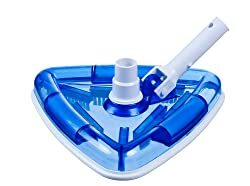 Pool Supply Weighted Butterfly Pool Vacuum Head is perfect for cleaning vinyl lined pools. It is not just the butterfly design that makes cleaning easier, but the multi-dimensional brushes at the bottom let you reach the corners. No debris will be left behind. It has an ideal weight to keep the body in contact with the bottom of the pool. With the EZ clip handle, it is easy to attach and detach the pole. This vacuum head by Swimline weights 1-1/2 pounds at its head which ensures that it stays down in the pool, making vacuuming easier. 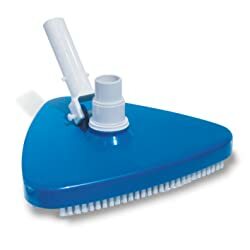 It has a half moon shape and there are brushes at the bottom to help you clean the surface. The brushes are replaceable so even if the bristles fall out, don’t worry. This vacuum head accepts 1-1/4 and 1-1/2 inch vacuum hose. Milliard Pool and Spa Vacuum Head is 13.5-inch wide vacuum with air relief valves that release excess suction. The head of the pool is adequately weighted to stay on the floor. It is made from ABS plastic material so you can expect it to last for a long time. As it’s wider, it makes the cleaning job faster. The vinyl brush at the bottom helps you loosen up the stuck algae and leave a sparkling pool behind. Poolmaster, Inc. 27402 Deluxe Air Relief Vinyl Liner Swimming Pool Vacuum is ideal for removing debris from vinyl liner pools and fiberglass. It’s 15.5 inches wide so it’s going to cover a wide area. The vacuum head has deluxe nylon bristles along its perimeter and underside. When you are cleaning the pool, you will be able to reach the sides, wall, and other tough corners. There are two air relief valves on the vacuum head meant to adjust suction strength swivel-function hose adapter. 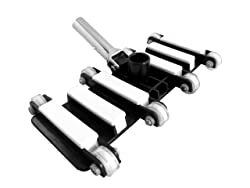 Its handle is made from stainless steel tension spring that lets you keep the vacuum submerged and level with pool floor. 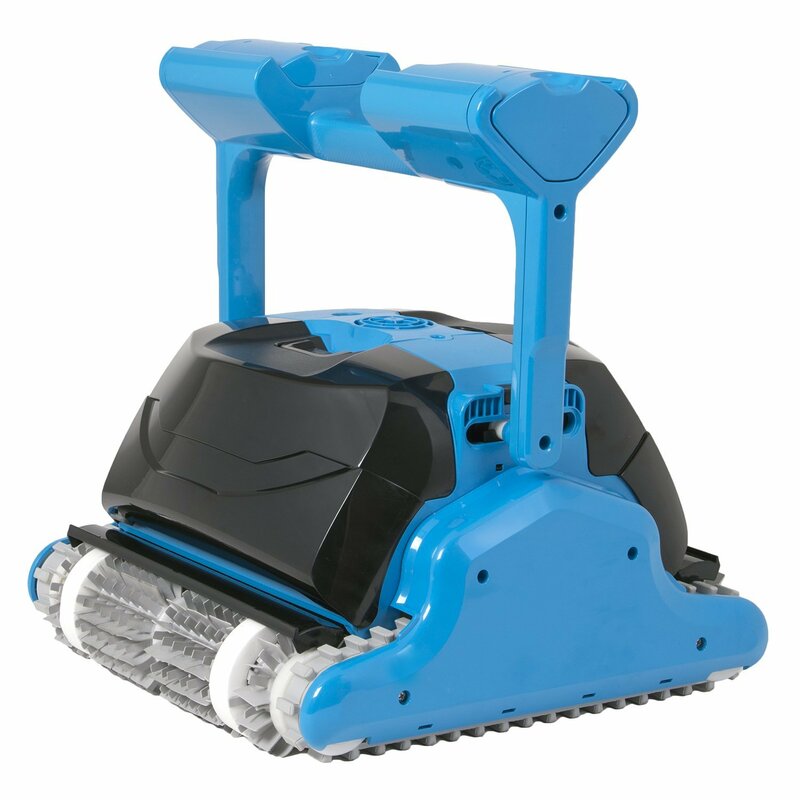 Although the vacuum head has a wider width, that makes it hard to use and clean the surface. Pentair R201286 222 Pro Vac Series is a vacuum head designed to clean both residential and commercial pools. It is rectangular in shape with wheels on the body that are adjustable. You can either increase or decrease the vacuum velocity. The vacuum head has a stainless steel shaft, ball bearing wheels, and a metal swivel handle. It is 12 inches wide, which is wide enough to help you clean the pool’s surface. The vacuum head has a suction chamber that concentrates the vacuum velocity with width flex strips and guides the debris back into the suction chamber. Poolmaster 18510 Triangle Vinyl Liner Vacuum is easy to maneuver under water. Even though it weighs at the head, but that is just to ensure the vacuum head remains under water. At the bottom of the vacuum head are polypropylene brushes that are replaceable. Although it says you can use the vacuum head with any hose and standard pole, some users have complained the pole connection is tight. HydroTools by Swimline Clear Weighted Triangle Pool Vacuum Head is another great unit to use. Its triangular shape lets you reach the corners of the pool easily. 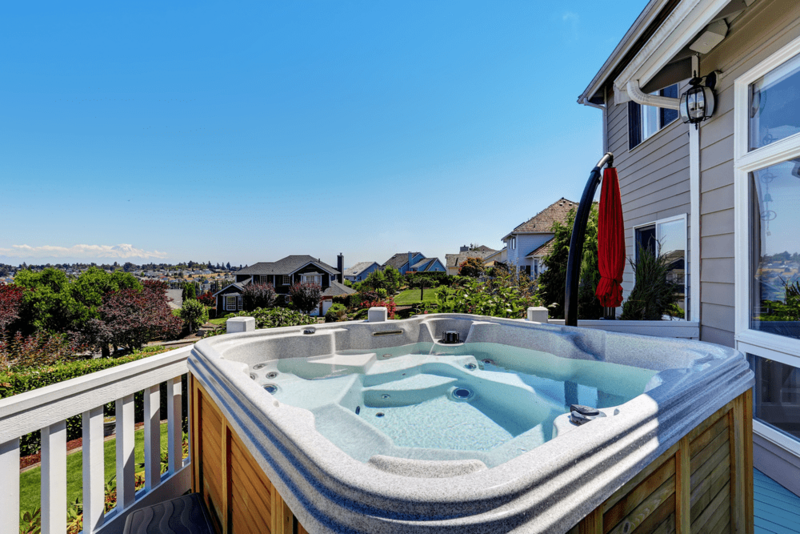 It has been designed for fiberglass and vinyl lined pools. Under the vacuum head lies angled brushes that are very quick in picking up debris. The weighted vacuum stays in the water where it is supposed to. Some users have complained that due to its weight, it is hard to maneuver. 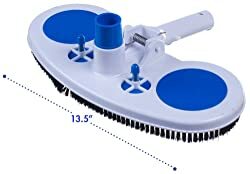 14-inch Weighted Flex Vacuum Head with Side Brushes by SplashTech is here to make your pool cleaning quick and easy. It weighs 2 pounds so it is going to stay submerged in the water but at the same time, it will be easy to control. At the sides of the vacuum head are nylon brushes that will help you scrub the algae when you vacuum. The vacuum head also has plastic wheels that further make it smooth to roll. 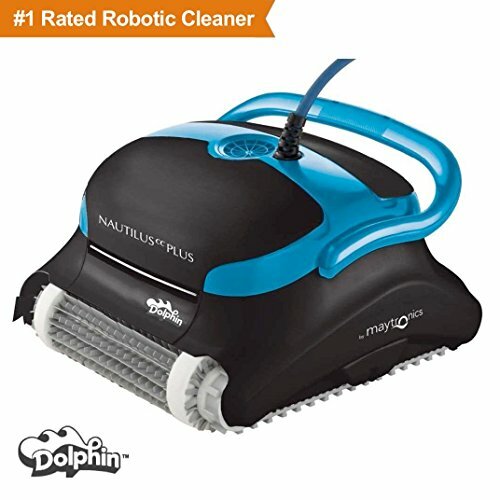 What To Look For When Buying A Pool Vacuum Head? 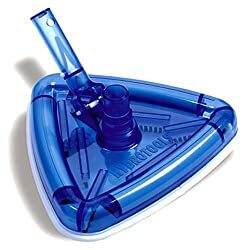 Some of the best pool vacuum heads have a triangular shape. This design is a preferred choice as it helps you cover a wider area and reach every corner of the pool with its pointed ends. It makes cleaning the pool a whole lot easier. Vacuum heads with a rectangular design are not a bad choice either. But they usually come with wheels to make them easier to move. 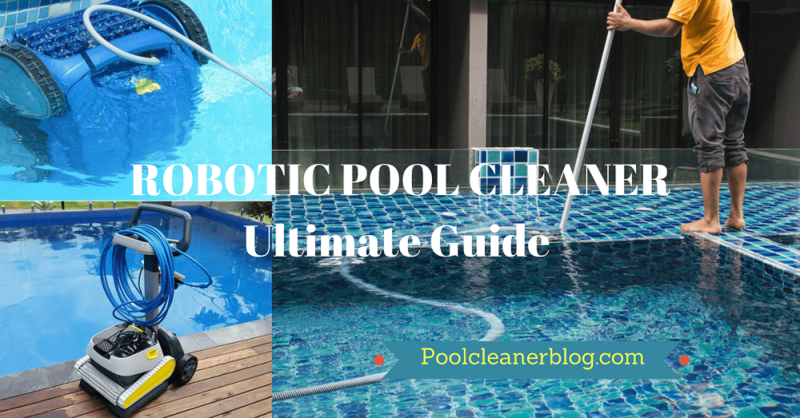 They may not be that user-friendly when it comes to cleaning curvy areas of the pool. 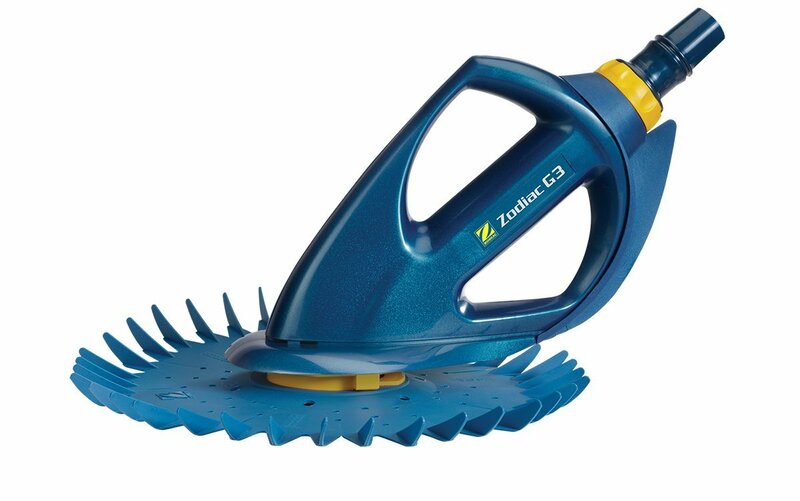 Butterfly and circular designs are available too but they don’t really add to the cleaning efficiency. It would be great to have a vacuum head with wheels. This makes it easier for you to move it inside the water. But remember that the shape of the wheels matters too otherwise, it may not help you with the cleaning. Rectangular wheels make it hard to reach the spots. On the other hand, if you choose a vacuum head without wheels, it would make the cleaning job slightly tough. You must be thinking a wide vacuum head would do the job well. The problem is if a vacuum head is too wide, it would increase the drag and make it difficult for you to move the vacuum head in the water. This would eventually make cleaning the pool difficult. The ideal width of a vacuum head should be about 11 or 12 inches. 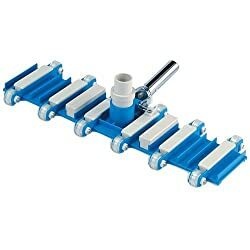 This will make it easier for you to clean the surface without causing a drag and making the process of cleaning exhausted. Vacuum head handles are mostly made of plastic or stainless steel. Now you must be thinking stainless steel would be a sturdier choice but that’s not the case. Over time, the stainless steel handle will become weak as it gets rusty due to water exposure. Plastic is hence a better choice but you have to be sure it is a strong one otherwise, the handle can crack easily. Vacuuming the entire pool isn’t really a fun job but if you have a great pool vacuum head, the job becomes easier. Vacuuming puts additional strain on you depending on the shape you have chosen for the vacuum head. That’s why choosing the right design and other features deserves extra attention as they make the maneuvering easier. If you were having a hard time choosing the right product, hopefully this guide will make your life easy by cutting through the clutter and bringing the highest rated and best selling products to you.